Kree Circle Writing - Is this from Cosmic Awareness? Coulson and Garret were writing symbols of lines and circles that looked very similar to the markings in the Eye Spy episode. Are these symbols part of an alien link to the wider cosmic Marvel Universe? Are they Kree? Why does Garrett seem to understand the writing while Coulson does not? Garrett calls this writing the "Words of Creation". The words and perhaps their meaning seem to drive Garrett crazy. Coulson has not been driven crazy yet, and also says he does not understand the meaning to the symbols. He simply has an impulse to draw them. This difference between Coulson and Garrett has not been explained. Coulson has speculated that the reason why Skye does not draw the symbols at all is that she is at least part alien. This also has not been fully revealed. 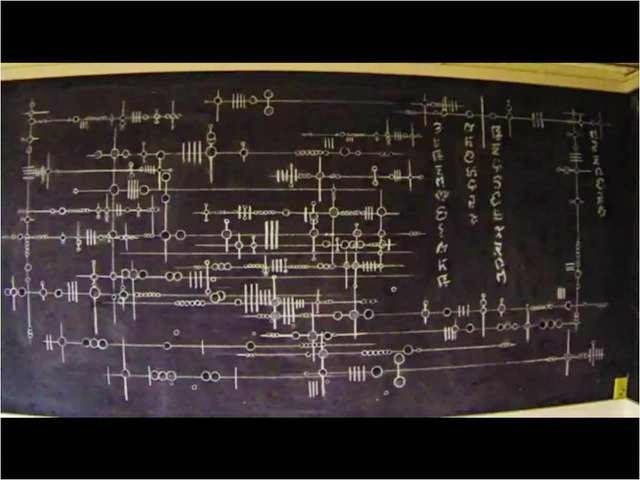 I think these patterns are a form of Alien writing, likely Kree writing. I say this because they look similar to the markings on the Kree body in the GH facility. I think specifically that the writing is a symbol of a Kree super power called "Cosmic Awareness." I am fairly confident that the Blue Alien corpse in the GH 325 episode was a Kree. See posts related to GH 325 for more details as to why. It appears to me that Coulson and Garrett have a form of what Marvel calls "Cosmic Awareness" this is an ability to be warned about dangers in the wider universe and how things are connected. It is commonly associated with Kree Super Heroes like Mar Vell. Many think that Coulson is linked somehow to Mar Vell and potentially will become him. A super power that makes the user aware of anything that could affect them on a Universal level. It does not give the user understanding, knowledge or intelligence just a warning. It has been shown be able to small dangers like detecting illness or cancer in people. It can also detect anomalies far away in distant parts of the universe. Cosmic awareness also allows the user to locate where the danger is coming from. Cosmic Awareness can cause madness in people. Particulary, if they are given it suddenly as adults. Genis Vell was shown being driven mad by his immense power and from the cosmic awareness. This madness would be similar to what happened to Garrett. 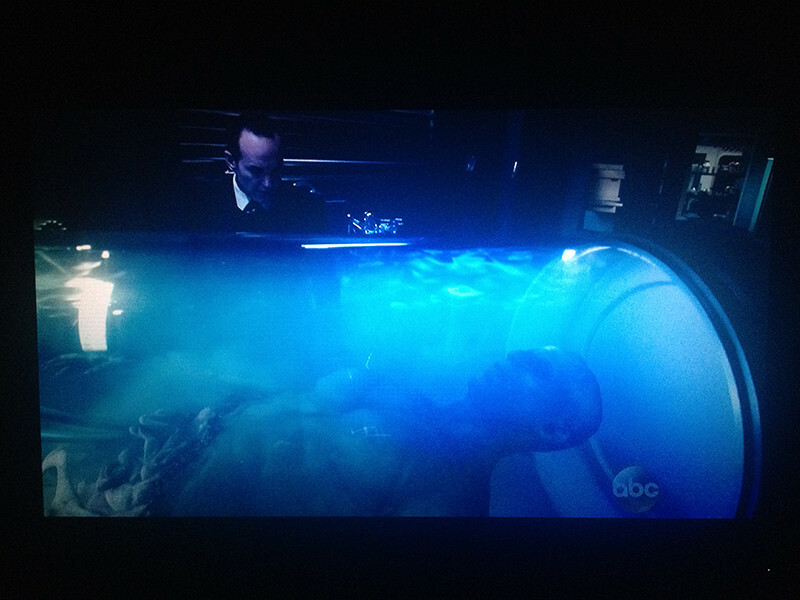 Perhaps Coulson is able to handle it better because he has some of the memories from the blue alien implanted in his mind. These memories were moved there in the TAHITI (Mind transference) project and allow him to cope with the cosmic awareness better than Garrett. The Eye Spy Alien Chalk Board - Not in a SHIELD or HYDRA facility. Additionally, there is another facility that is not a SHIELD or HYDRA facility that the Clairvoyant wants access to so he can see examples of theAlien writing written on a chalk board. This facility was in Belarus. Perhaps the Russians found a Kree, or someone who was cosmically aware and then found these examples of the writing. There are some who believe that there are separate writings on the chalk board in the eye spy episode that are actually Skrull writing. I have been unable to confirm or disprove this rumor as of yet. Some markings similar to the body on blue alien? We similar writing when Coulson recalls some images from his resurrection. My guess is the writing is Kree related. Do the Markings also look similar to what is on Blue Kree? The Chalkboard showed human knowledge of things like the 616 universe and The Fault. I have feeling the lines and circles are similar to the nine world maps. Some how cosmic maps of galaxies or different dimensions. Maybe a map of the Kree Empire?